Willo Pond Morgans has produced well over 100 foals. 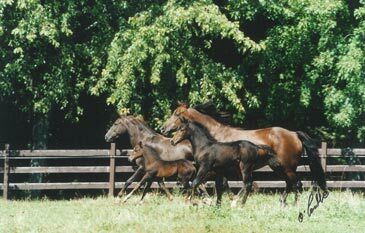 ur stallions stand at stud to outside mares as well as producing offspring for Willo Pond Morgans. We stable beautiful Lippitt Morgans which prove to be consistent show winners. At Willo Pond Morgans, we are dedicated to preserving the purity of the Lippitt Morgan bloodlines through our high percentage stallions and mares that have been linebred for generations. The remarkable versatility of our Lippitt Morgans produces outstanding performance horses for both riding and driving. We invite you to visit our stable in the scenic Kettle Moraine of Wisconsin to observe the natural beauty and temperament of these old type Morgan horses. Show or family horse, we have the perfect Morgan for you. Please request a breeding contract and contact us with any questions you may have about either breeding to a Willo Pond stallion or purchasing a Willo Pond foal. Would you like to have a foal, but do not have a mare/stallion to produce one for you ? We welcome you to come choose one of our mares and/or stallions and we will breed them to produce a foal that you will be very proud of. Visitors are always welcome at Willo Pond Morgans. Please call for an appointment and we will be happy to show you our herd of 17 Morgans.